Lesson: Using Standard Objects in SketchList 3D. Standard objects – such as cabinet doors, are reusable design objects in your Sketch list 3D library. Once you create a design, for example of an assembly, you can save that as a standard to be used over again in other projects. 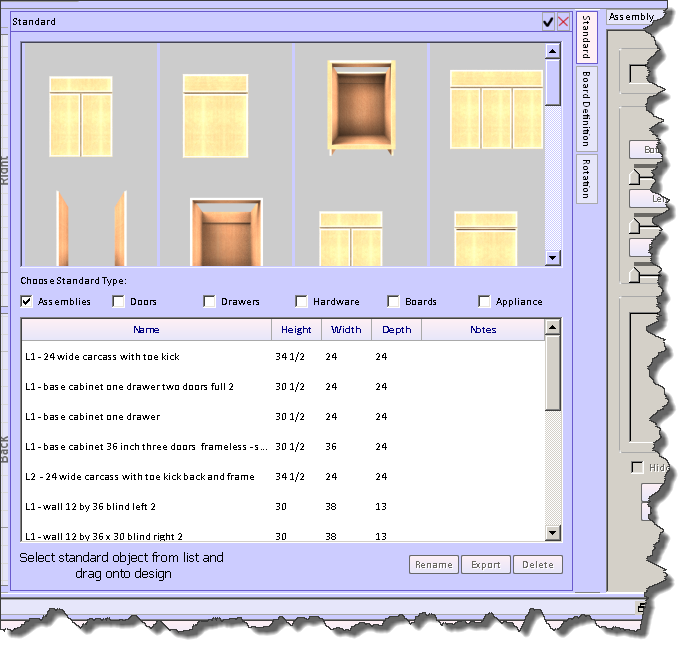 But you can also make standards of boards and use them to quickly create custom cabinet layouts and designs. Definition A standard object is any object or container designed is SketchList 3D and saved in the standard library. Standard objects are saved designs that you’ve created for re-use in other designs. Standards are grouped as any one of six different types. The advantage of using standard objects is your ability to create a design specifically to the way you work and take that save design and use it in another situation. This gives you the ability to have a custom-built template that can be resized gusted for any application. You can drag an assembly into a project, resize it, perhaps add or delete a door or drawer and with that repurpose the template cabinet for another use. Dragging’s dragging standard objects into the SketchList design follows the same rules as dragging new objects or containers into a design. Assemblies can only be dragged into the project level. Containers – door, drawer, or hardware can only be dragged into assemblies. Hardware can be dragged into an assembly or into a door or drawer. Boards or board like objects can be dragged into any container. And in fact you can save an entire project using the save as file menu option to take a project and save it as a template to be opened and used in other jobs. Just make sure to keep renaming with the save as file menu command. In the grouping scheme of sticks shown above we include a standard object type called appliances. This is where you would save and store and retrieve an object such as a stove or refrigerator or even a fireplace. It is a bit of a catch-all category. To insert a standard object into a project go to the standards tab near the top right edge of the main SketchList 3D form. When you click it the standards form opens. Noticed in the upper right-hand corner of the form there are a checkmark and a red X. If you click on the checkmark you be able to take that form (any form under a tab) and move it anywhere on your computer screen (s). There are six check boxes on the form. You can click any or all of them to include that type of standard object in the scrolling list. To scroll through the standard objects use the slide bar in the image area or the slide bar in the text list area. To insert into the design click on the object and holding down your mouse key drag the object onto the spot in the design where you want it inserted. SketchList 3D always inserts objects in the center of the container. This makes it easier to rotate the object. If the object was inserted at the point of origin rotating in any direction would take one of the corners of that object in place it outside of that container. Not allowed in SketchList 3D. You can re-size the inserted object by using any of the re-size techniques presented in the lesson on sizing and re-sizing SketchList objects and containers. if you create a new object or modifying existing standard object you can easily make that new or modified design into its own standard. To do this select the object and click the make standard button on the form. To do this make standards of your work early and often. If you are making a standard side piece for a cabinet and more or less always use that side in your cabinets design the side and save it as a standard. That standard side may have a toe kick bottom shelf dado back rabbit and holes for shelf pins. And if you save it as a standard board then you need not create that it can but simply call it into your next assembly. You may choose to save shelves, stretchers, any part really that you use over and over again as standards. When you finish this you could say that as a standard assembly. The same idea applies to doors and drawers. Once you make your drawer or door save it as a standard drawer for use in other applications. You might even experiment with creating your face frame as a door and saving that face frame/door as a standard door for applying to the front of the carcass. Re-sizing standard objects is fairly easy to do in SketchList 3D. So when you establish your library you don’t really need one copy of all objects in many different sizes. A kitchen might have five or six different assemblies (for example base and wall units, blind corner), one or two drawer types, and possibly to doors. The point is that there is some smaller number of objects that you can use as building blocks to create practically any project that you want to tackle. With some thought you can created to fully introduce new containers/objects to your SketchList 3-D standard library. There is a video of making a face frame and saving it as a standard. In order to accomplish this a create container, specifically a door, to the necessary size. By using the insert new board functions we inserted two rails and two styles into this “door”. Then save the door, renamed as face frame, as a standard. Now that face frame is available for use in any cabinet.